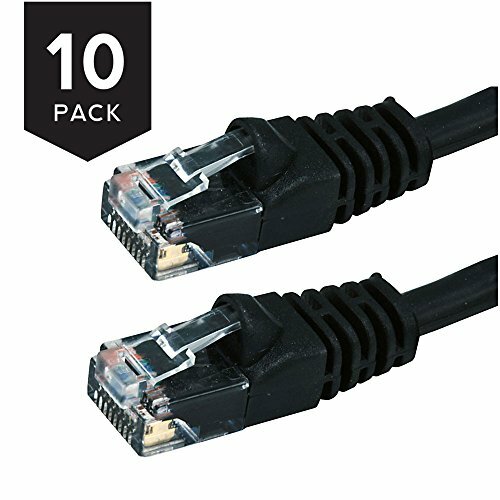 Buhbo CAT 6 Cables are made of 100% pure copper wire and 50 micron gold plated RJ45 plugs. * Designed For: Network Adapters, Hubs, Switches, Routers, DSL/Cable Modems, Patch Panels, Computer Networking applications. *UTP and STP is Unshielded Twisted Pair and STP is Shielded Twisted Pair. UTP is accepted for residential and general commercial installation. *24AWG and Stranded is AWG (American Wire Gauge) indicates wire thickness. Higher the number, thinner the wire. 24AWG or 26AWG is commonly used for ethernet cables. *RoHS (Restriction of Hazardous Substances Directive) This directive restricts the use of hazardous materials such as lead or mercury in the manufacture of electronic and electrical equipments. Cat6 UTP Ethernet cable made with UL Listed PVC Jacket for high bandwidth. 24 AWG stranded bare copper wire and a 50-micron gold plated body RJ45 plug provides universal connectivity. Snagless cable boot for protection and molded strain relief increases the life span and durability of each cable. Premium high 550 MHz bandwidth ensures that your network is faster and more reliable. If you have any questions about this product by Buhbo, contact us by completing and submitting the form below. If you are looking for a specif part number, please include it with your message.